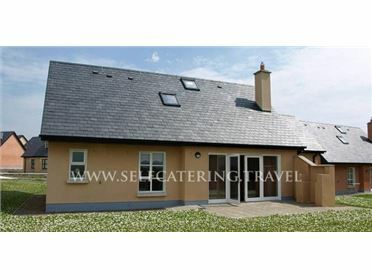 Errigal View is in the village of Dungloe in County Donegal overlooking the river. There are six bedrooms, two with en-suite, one bathroom and can sleep a maximum of thirteen people. This property provides a well-equipped kitchen and sitting room with an open fire. Outside the front entrance is a lovely lawned area. Errigal View is an ideal break for large groups, couples and families all year round. Up until 1762, entry into the town of Dungloe in Donegal was only possible via the stepping stones dotted over the river. Nowadays, visitors from all over the world can take the much easier route over Donegal Bridge and enjoy this delightful town in County Donegal. Electric central heating with open fire. Electric oven and gas hob, microwave, fridge / freezer, washing machine, tumble dryer. TV with Freeview. WiFi. Fuel, power and starter pack for open fire inc in rent. Bed linen and towels inc in rent. Off road parking for 5 cars. Lawned garden. Sorry, no pets and no smoking. Shop and pub 1 mile..